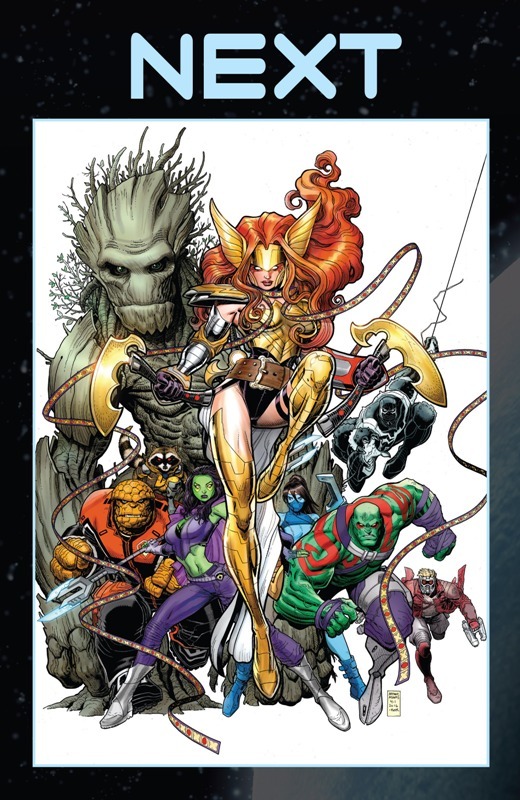 So after a couple of tries to be really pertinent in the Marvel Universe and prematurely removing her from the team, Angela has finally rejoined the Guardians of the Galaxy in Guardians of the Galaxy # 9 by Brian Michael Bendis and Valerio Schiti. So in this issue, it appears that the gang is brewing a rescue mission to rescue somebody. At first we didn’t know who it was. Bendis had written the mission to be vague plus he kinda did show that there were members of the team that wasn’t in the introduction page. But we’ll just skip ahead to the team actually attacking a Badoon prison planet to rescue Thor’s sister and Spawn’s former ally. 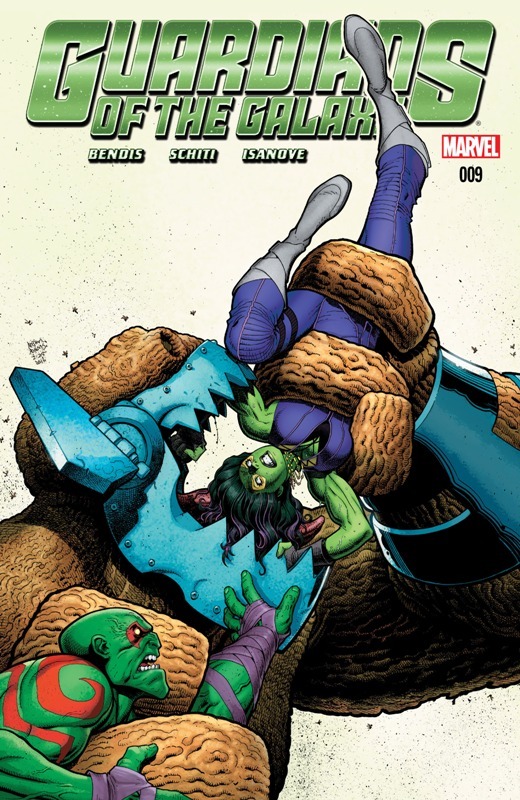 So in Guardians of the Galaxy # 9 the remaining members of the Guardians invade one of Badoon’s prison planets by their lonesome. No Spartax allies, no Avengers, just them. 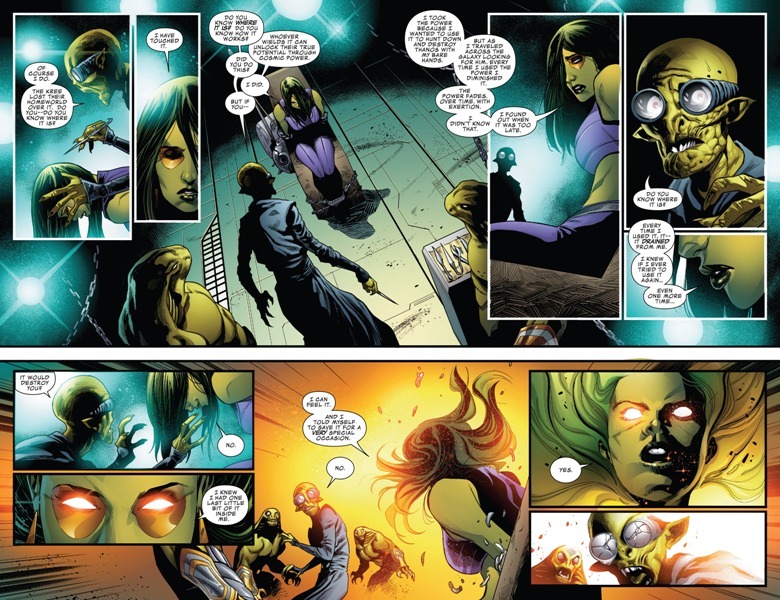 Of course two of the Marvel universe’s baddest killers are at the forefront – Gamora and Drax the Destroyer. 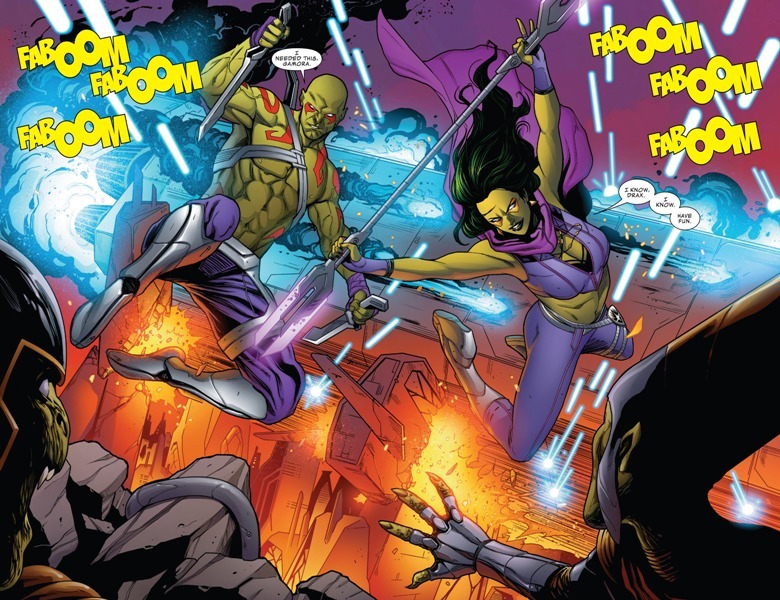 The Badoon want a lot of things from Gamora including the location of Thanos, who they want to kill as well because Thanos. 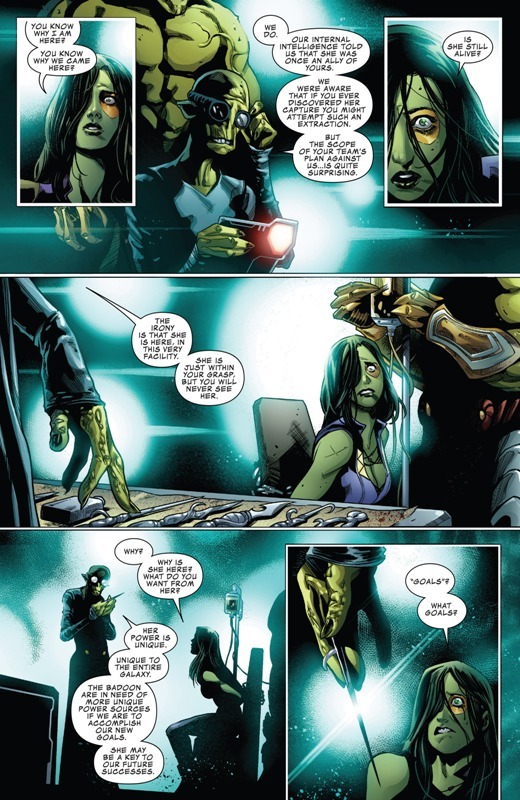 Moments before the interrogator begins the actual torture, Gamora mentions The Black Vortex. Right, I was just going to ask what happened to her Black Vortex powers, she and Angel of the All New All Different X-Men team retained their powers at the end of that story arc. 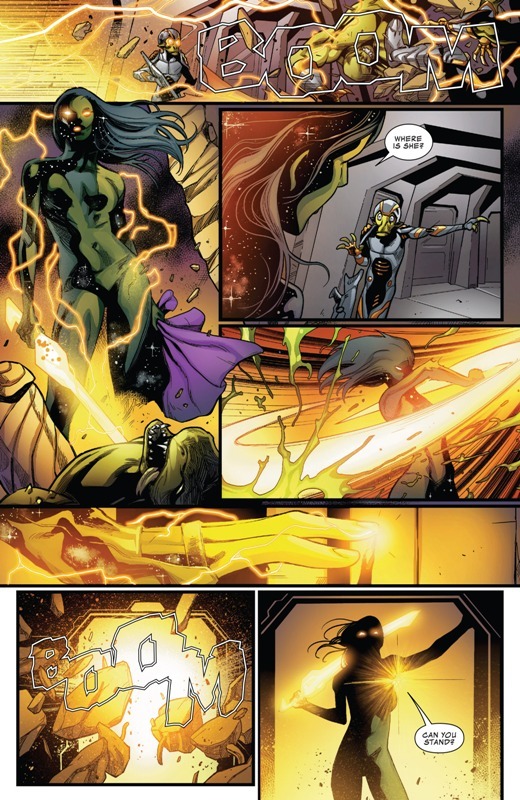 But while Angel manifests and doesn’t really show any signs of losing the Black Vortex powers, here’s Gamora talking about her powers slowly fading away every time she uses it. After using up her last batch of Black Vortex powers and finding out Angela’s location, we finally touch base again with our heroine. The bloody sisters are back! Huzzah! 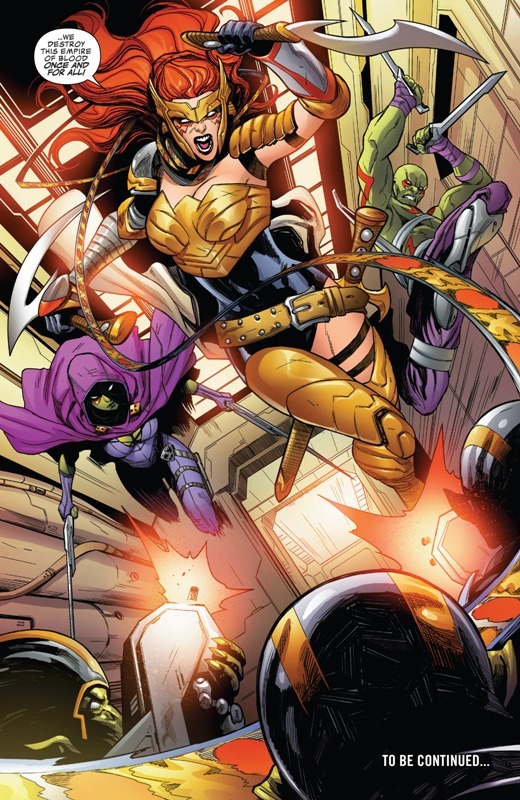 At this point Drax also appears with Angela’s gear and we get a pretty good illustration of why Angela’s such an underated hottie in the Marvel Universe. 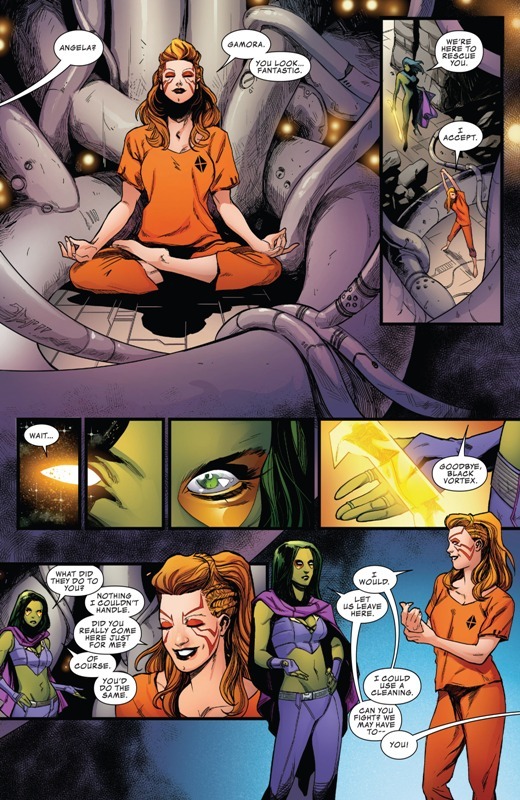 Anyway, with Angela free to go, the trio now set their sights on rescuing Kitty Pryde and Peter Quill who have been captured during their “invasion”. For all its worth, it felt like a good story. It was the art plus the general plotting. Of course, as always, Bendis manages to screw up or complicate continuity here and there. Small lapses really but adds up to the pile of beef some readers and long-time fans have with the writer. As for me, I’ll be waiting for the tradepaperback for this arc.